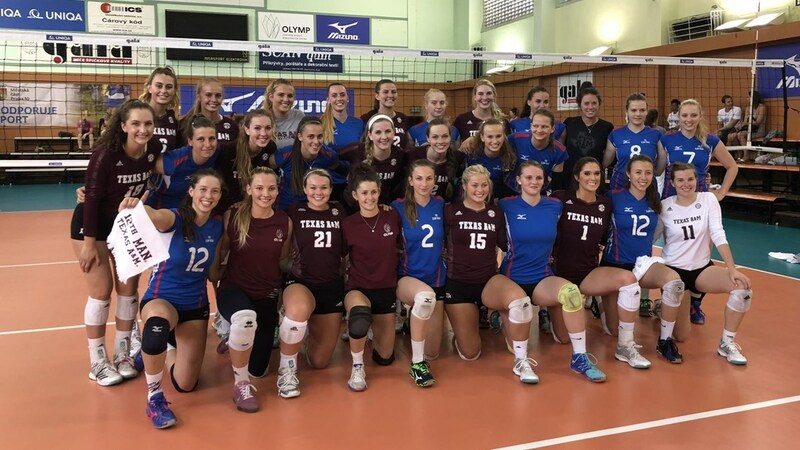 PRAGUE – The Texas A&M volleyball team faced the Olymp Praha professional team today and defeated the host squad, 2-1 (25-19, 27-25, 17-25). The Aggies got out to a fast start and quickly gained the momentum at the beginning of the opening set by scoring the first six points of the contest. A&M, which held the lead from start to finish, equaled its largest lead at 12-3. Olymp Praha later got within 22-17 before the Aggies used a 3-0 run to close out the frame. A kill by outside hitter Maddie Douglas put A&M ahead, 13-8, in the second set, but Olymp Praha rallied and took its first lead at 16-15. A&M regained the lead, 17-16, on an ace but the home team stayed close and eventually regained the lead, using a 3-0 run to pull ahead, 23-21. A&M tied the score at 23-23 on a kill by Douglas, but a service error put Olymp Praha at set point. Outside hitter Hollann Hans extended the set with a kill from the back row, and Douglas’ next attack landed on the back line for a kill to put the Aggies up, 25-24. Another A&M service error evened the score, 25-25, but opposite hitter Samantha Sanders got a kill on the ensuing play, and Hans teamed with middle blocker Mallory Talbert for a block to clinch the 27-25 win. Setter Camille Conner had two kills and also set up middle blocker London Austin-Roark for a kill on the slide attack during a 3-0 A&M run that gave the Aggies a 9-7 lead in the third set. An ace by Sanders would later give the Aggies a 12-9 advantage, but Olymp Praha rallied, scoring seven unanswered points to go up 17-12. The home team continued to pull away and closed out the match with a 25-17 win in the final set. The Aggies head to Maribor, Slovenia, in the morning, stopping in Vienna, Austria along the way for a few hours of sightseeing in The City of Music. Following the day of travel, A&M will return to the court tomorrow evening to take on the Austrian National Team in Maribor. Fans will be able to keep up to date on the Texas A&M volleyball team’s travels on 12thMan.com and Facebook as well as on Twitter and Instagram by following @AggieVolleyball. “I think we were a little bit better today. It was good. We executed the things we were wanting to focus on. Our competition is going to get better and better, so I think the team responded well. We played pretty clean the first two sets, and then we changed some things up so we challenged them as individuals. We need to be a little sharper on that side of the ball—ball control when it comes to passing and defense. So the first two sets we were very good. I was very pleased with them.